Savour freedom while cruising the roads of this unique northern land, stopping now and then to stretch your legs in ancient villages and modern-day Russian cities of the Northwest Russia. See the magnificent collection of Hermitage, which used to be the official winter residence of the Russian tsars in the Northern Russian capital Saint-Petersburg. Get acquaintance with ancient monasteries in Karelia and the Saami culture in Russian Lapland. Visit the numerous historical and cultural points of interests, make a boat excursion between the multitude of islands in the Archipelago of the White Sea’s Kanda Bay and pass the unique Kandalaksha Nature Reserve. Explore Murmansk - the city-harbour which is the capital of Murmansk region and the biggest in the world city above the Polar circle. Your tour description is waiting for you and also the keys of your hotel rooms are waiting at the reception desk. With the support of Kola Travel your Car holiday on the Kola Peninsula in Russia will be pleasant and hassle-free; you will have the freedom of being without a guide, yet feel at ease in unfamiliar cities. Day 1:Cross the Russian border from Finland and travel via Vyborg to Saint Petersburg and check-in at a hotel in the city centre. Day 5: Breakfast and check-out from hotel. Boat trip to Kizhi (open air museum). Overnight at camping close to Petrozavodsk. Day 6: Drive to first Russian resort Marsialnye Wody. Drive to Kivach Waterfall and Dendrarium. Drive to Kem and overnight in a nice hotel complex close to the harbour. Day 8: Drive to Kandalaksha; check-in at hotel. At the reception desk pick up an information package which includes route descriptions and museum and restaurant recommendations. Drive up to a high point on the shore of the White Sea. Seals and even beluga whales can be spotted in the sea. With a ticket provided by Kola Travel, travel by boat to the Babylon Labyrinth, a stone structure of archaeological interest. 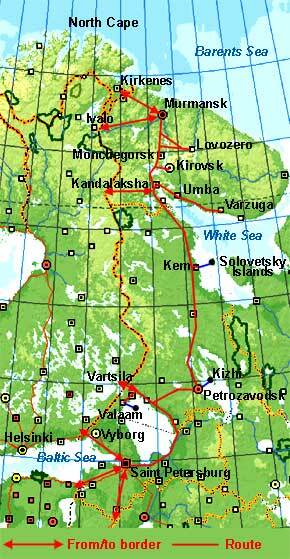 Return to Kandalaksha, explore the town. Enjoy a late dinner in a restaurant; if you wish check out a discotheque. Overnight at the hotel. Day 9: Drive to Kirovsk, and explore the town; check-in at hotel. With tickets reserved by us, you can visit the Botanical Garden located close to Kirovsk. In Apatity (15 km away) visits can be made to the Museum of the European North of Russia, and to a specialized shop which sells jewellery, and stone carvings and other folk art. If you wish, drive to a village nearby to visit the wooden house where the first geologist to explore the region lived. In the evening enjoy a dinner in a Bowling Centre or in a restaurant at the hotel. Overnight at the hotel. Day 10: Drive to Monchegorsk; check-in at hotel. Places to visit in Monchegorsk include the largest Orthodox Cathedral on the Kola Peninsula and the Museum of Coloured Stones. Drive to the top of the mountain above the city to see the view. You may also take a short yacht-trip around Imandra Lake with its multitude of islands. For dinner there is an excellent small restaurant close to the hotel. Overnight at the hotel. Day 11: Drive to the village of Lovozero - the capital of Russian Lapland. Lappish people live to the east of Murmansk and although their way of life has changed drastically in recent years, they continue to be "Reindeer People". Visit Lovozero’s Historical Museum. Proceed to Murmansk. Arrive in Murmansk; hotel check-in. At the reception desk pick up an information package. Day 12: We suggest you visit the Regional Historical Museum, the Art Museum and the Folk Art Centre. Dinner in a recommended restaurant, which has an excellent and inexpensive menu and fine music. Overnight at the hotel. Day 13: There are a number of interesting places to visit that are related to the sea and maritime culture. These include the Naval Museum, the Museum of the Polar Research Institute of Marine Fisheries and Oceanography (not open to the general public but a visit can be arranged for you), and the Oceanarium (tickets can be reserved upon request). For groups of 5-15 persons an excursion to an operational atomic icebreaker can be arranged. 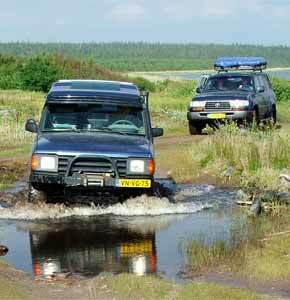 Day 14: Spend a few hours in Murmansk or drive directly to the border at Lotta (Finland) or Kirkenes (Norway). Visit the old churches in Kola Village on route. Distance from Murmansk to the border point at Lotta (close to Ivalo Finland): 245 km and to border point Borisoglebski (close to Kirkenes, Norway): 245 km. Any date you want! Just send Ihr request! • Sea excursion to labyrinth "Babylon"
• Excursion to Botanical Garden. • Support by Kola Travel's Helpdesk (in Russian, English, Dutch and German language). • Ticket for sailing yacht on Imandra Lake (on request) – EUR 30,-- per group.